21 December 2018 | Jolly Harbor Marina, Antigua, W.I. OMG ( that's gosh), We Took Lucky Bird Mountain Climbing Today! Yup, as the title says we are over the half way hump, actually more like one third to go. But first let me step back an make an observation regarding our precious ocean waters. No politics, no bias and I'm not trying to promote anything, so here goes. We left Guatemala at Livingston and headed out into the Gulf of Honduras. One of the first things that struck me as I looked out at the water around us was the incredible amount of STUFF floating by. Both sides, close to the boat and off as far as I could see. I couldn't count to ten before another piece of white stuff would pass by, or we would pass by it. Small chunks of what looked like Styrofoam, then plastic bottles, and larger pieces of plastic. Again I couldn't count to ten seconds before seeing something. An awakening. I never realized just how bad it is getting out here on the open waters. Jump along our sail to Grand Cayman, some 400 or so miles out into the Caribbean. Yikes!! the same STUFF but now I could at least count to thirty between objects. Fast forward toward Jamaica, further into the Caribbean, just about the same. 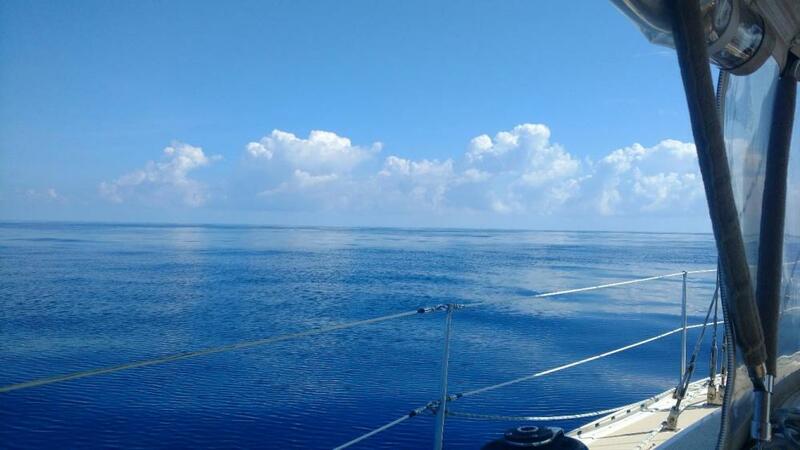 Mind you we are sailing in the northern portion of the Caribbean, just one small section of this vast open water area. To those of you in the know and are already aware, these observations must be disheartening all-the-while confirming what you are already sadly aware. Alice and I were naive to this issue or maybe just unaware not having been out here since back in 2010-2011 and then on the Eastern side. But now we are aware and it is discouraging to say the least. I'll stop at that before becoming preachy or political. Our plan upon leaving Port Antonio, Jamaica was to sail past Haiti and find a harbor along the southern coast of the Dominican Republic, passed Cabo Beata. Mother Nature decided to turn off the wind so on with the engine. On and on still no wind. Then 6 knots true, then 8 and maybe we could sail but hold on, the light wind was on our nose and our sailing angles were awful. About this time I also noticed our GPS speed was 1.5 to 2 knots lower than our through the water speed. Oh crap, wind and current against us. I figured for the amount of hours were on this passage the adverse current made the trip 9 to 10 hours longer. I'd look at the chartplotter ETA and it would say 1day 13hours. We'd go for two hours and it was 1day 13 hours, now that's frustrating. We were reducing miles but increasing the time to go those fewer miles. I knew based on the Grib files that come Friday around noon the wind would start building from the East. Wind with the current and now we had waves as well. If you've ever powered into larger waves you know each one lifts and then drops the boat absorbing a lot of forward energy, the boat speed drops to 2 - 3 knots. Now there's a huge ARGG!! I had to take action, this was going to take forever. Up with the sails, damn the terrible wind angles and look to get out of the current. So our first tack was toward Haiti, I figured closer in toward the shore we might see less current. Hurray, boat speed's back but now we have to tack back and the true wind is 11 - 15 knots on the nose making apparent winds uncomfortable for us on LB. We reefed, then we rolled up the jib and started powering again and by this time we'd given up hope of getting around Cabo Beata before the forecasted 30 knots arrived. It's time to implement plan B. Look for a safe protected harbor but along the Haitian southern coast there aren't many and we had already passed the safest Il da Vache. So DR here we come but slowly. Long story short, trying my best not to drop LB off a 4-6 footer during two hours of angst, we finally dropped the hook around 1530, 54 hours from Jamaica. a blistering 5 knot average. So here we are waiting out this trade wind bash. Hoping that by Monday the trades may have blown themselves out and we can continue our upwind dash to Antigua. Let's leave this on a positive note. We've seen clear blue skies, star lit nights and have had a full moon with us for many nights. Just a change of 10 -15 degrees either north or south of course please. Alice and I have spent considerable time together on the water; cruising and racing on the waters of New England, the Caribbean and Lake Michigan. Sailing is our passion and together we've been fortunate to experience the thrills, the camaraderie and the enjoyment boating provides. [...] Our cruising has taken us from Nova Scotia to the Florida Keys and to the islands of the Caribbean. Our racing has filled closets with trophies; given us the opportunity to visit Bermuda numerous times; to go around the buoys countless times; to do some 13 Mac races and to share our love for boating with our two daughters. Now Alice and I are preparing for our life's next journey. We are the crew, our home-on-the-sea is a 1990 Moody 425 named Lucky Bird. We seek the freedom, excitement and challenges of voyaging. This is our second journey south to the Caribbean. This time we've chosen to exit Lake Michigan and proceed south through the in-land waterway system to Mobile. We'll start around Labor Day and take our time exploring the history of middle America. Bob and Alice return to Lucky Bird after spending the summer in Addison.